LOARA AND BOLSA players battle under the basketball in the Matadors’ 65-61 win Friday night. Above, Matador Ruben Nunez (22) goes up against Tyler Nanthavong (4) of Loara (Tribune photos). It was a case of the trees versus the treys. The undersized Bolsa Grande boy’s basketball team – sparked by a powerful three-point game – upset and defeated a taller Loara squad 65-61 in a Garden Grove League matchup Friday that scrambled the standings. Bolsa is now 3-3 in the GGL (11-11 overall), while Loara fell to 4-2 and 14-10. 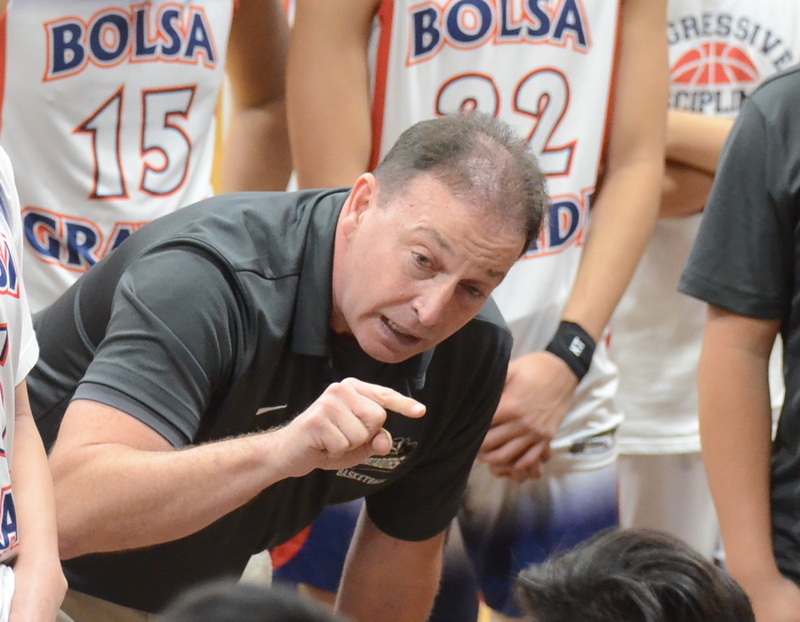 BOLSA COACH Todd Halbreich makes a point in game vs. Loara. The coach’s heart did undergo a workout. The Mats survived a frantic fourth quarter. After building a lead as big as 13 points at one juncture, they had to fight off a late surge by the Saxons – and their own wobbly free throw shooting – to nail down the victory. In upsetting the visitors, Bolsa relied heavily on outside shooting, and no one rung up more of that than Aaron Phan. The 5-foot, 6-inch point guard led all scorers with 20 points. Loara led 15-7 at one point in the first quarter, but the Mats caught them at 16-all and extended their lead to 32-22 with 1:50 to go in the second quarter on a trey by Phan. TOP BOLSA scorer Aaron Phan (0) worked hard on defense, too. 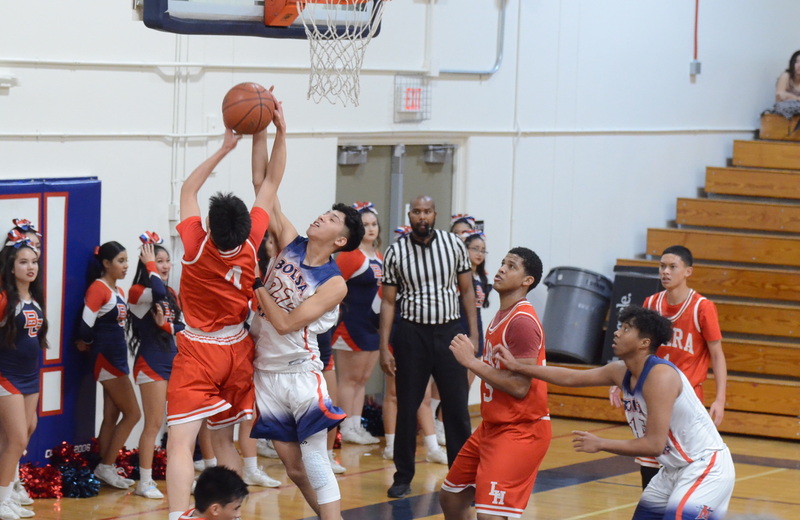 Although the Matadors had only one player listed as six feet tall – compared to Loara’s five – they battled on the boards and it wasn’t until late in the game that the Saxons’ height advantage started to tell. Cade Flowers, a 6-foot-2-inch forward, led Loara with 18 points. With less than a minute to play, Loara closed to within three points at 62-59, but the Mats hit three of four free throws to hold the Saxons at bay. 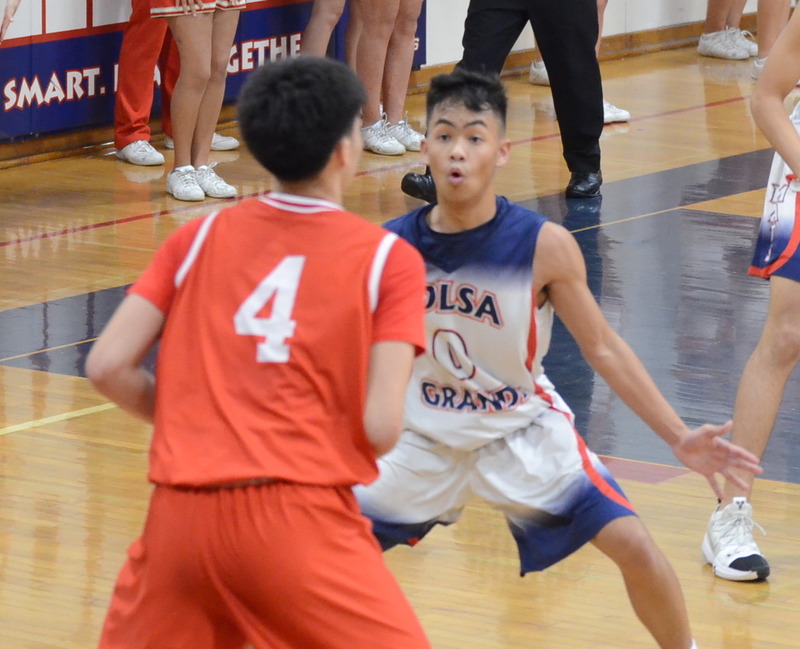 Other top scorers for Bolsa were Andrew Pham (13 points) and Brandon Lai (12). The Matadors will host Santiago on Tuesday, and then visit Rancho Alamitos next Friday. Here are prep basketball scores for local games Friday night. Results will be posted as they arrive. Garden Grove 54, Westminster 38. Crackdown on illegal businesses seen?